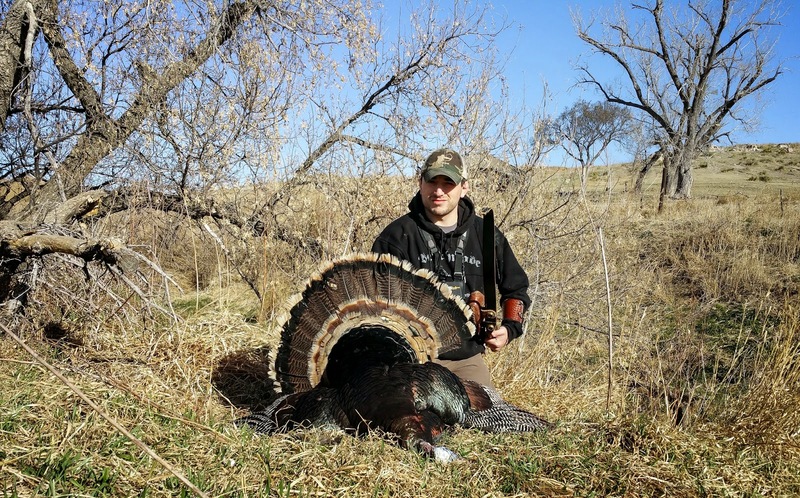 The last few years we have kind of started a tradition for the opening weekend of the Nebraska turkey season. 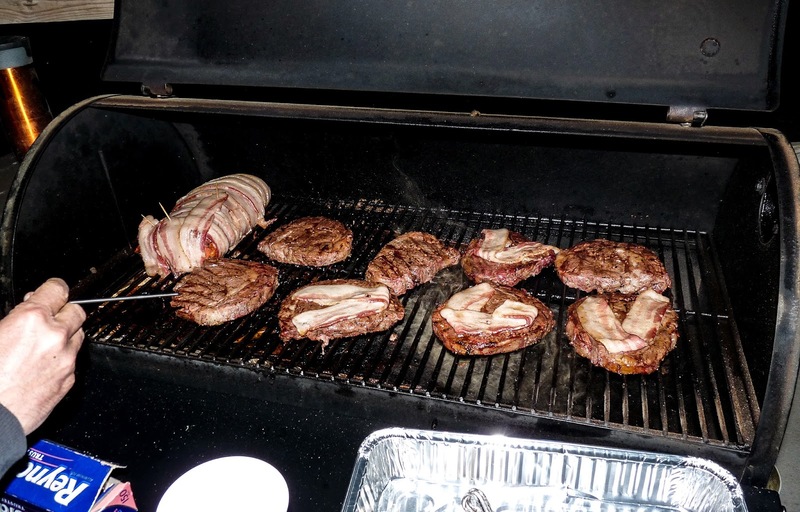 My cousin's good friend, who happens to farm some excellent turkey hunting land, treats us all to a good steak before he lets us hunt on his land. How's that for being spoiled? Years ago my cousin and I were looking at a few strutting toms as we sat on the public side of a fence line. Chad leaned over and said, "What would you give to be able to hunt that place!?". Wouldn't you know that that place is exactly where we hunt now? 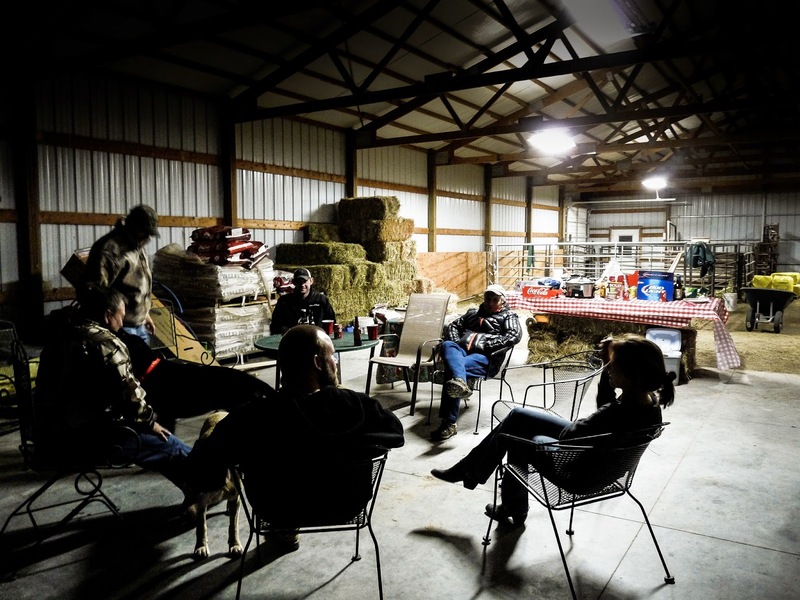 Heath, the farmer, sets up a few tables in his barn where he grills everybody an unbelievable steak. 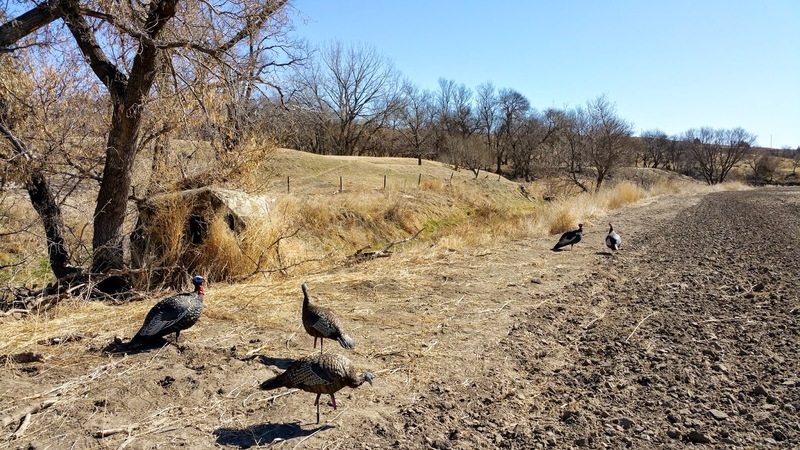 The turkey numbers in much of Nebraska are down. We still had a good number of birds filing into the field we were hunting. Danny and my brother-in-law Kelly were both inundated with hens Saturday morning. No toms came close enough to shoot. After the turkeys moved off Danny jumped in Chad's pickup to go hunt another creek. They barely drove a mile before spotting a turkey walking down a cedar row. Danny jumped out of the truck and headed towards the bird. Chad just had time to turn the truck around when he looked up and saw Danny be-bopping down the cedar row with a bird over his shoulder. Danny put the bird in the bed of the truck and jumped in the passenger seat like he just got done answering a call to mother nature. Leave it to my little brother to treat a spot-and-stalk turkey like just another day in the woods. He creeped down that cedar row until he thought he was within 50 yards of the bird. Danny eased through the dense trees to get an idea of where he was. 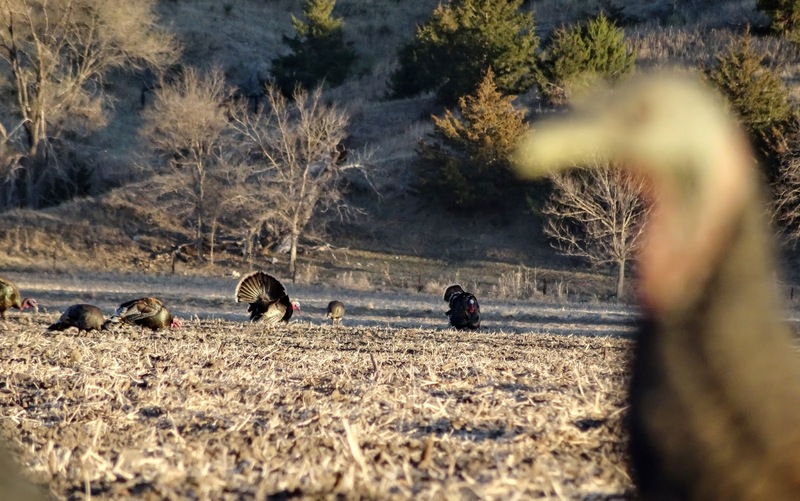 As he peeked out he noticed the turkey slowly meandering away from him at 30 yards. Danny nocked his arrow and eased out just enough to send an arrow on the way. Chad, and former RMSGear employee Andy, had already had a great morning by the time that Danny was putting the sneak on the bird above. 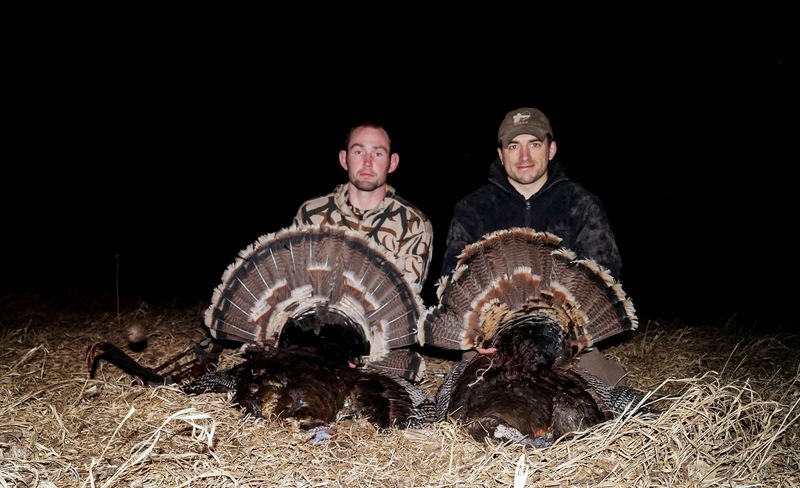 They both decided to take one for the team and go to the "bad field" with not as many turkeys. Chad and Andy are both known for their generosity. It was swell of them to be so self sacrificing. If you read some sarcasm in the last few sentences, good, I'm glad it came across. But in all honesty these two really did choose to hunt an area with fewer birds. They were the only ones that had a chance to scout it, there were less birds, and their chances were not as good. They really did "take one for the team". All that doesn't mean much with Chad and Andy. 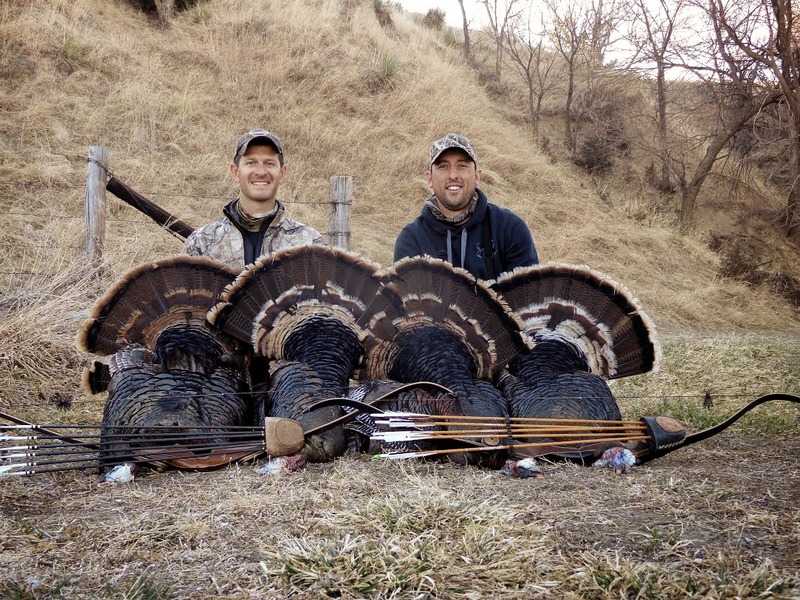 They are both great shots, great callers, and great turkey hunters. No surprise that four of their arrows resulted in four dead toms. You could put these guys anywhere and you'll probably still see red on their arrows when they get back to camp. I missed the big steak and the good times this year. I had to stay and watch the archery store. Which is okay, I got there late but I hunted more days. Trade-offs. Kelly and I adjusted our first morning set up because we noticed the turkeys moving in a different pattern than years past. We brushed our blind in as good as possible and held tight. I am still coming off of a major foot surgery, so I couldn't walk that well or that far. As bad as I wanted to be out of the blind, that's my only option for the time being. Kelly shot a nice tom early in the afternoon on the first day. We were looking at a bunch of turkeys to our east when we heard the low drumming of a nearby tom. Kelly and I slowly turned around in our blind and saw two giant toms about to start beating up our decoy. The toms came to our calls from the west as we were looking at birds to our east. Kelly made a great shot. There were lots of turkeys around, but Kelly used the creek at our backs to retrieve the bird. 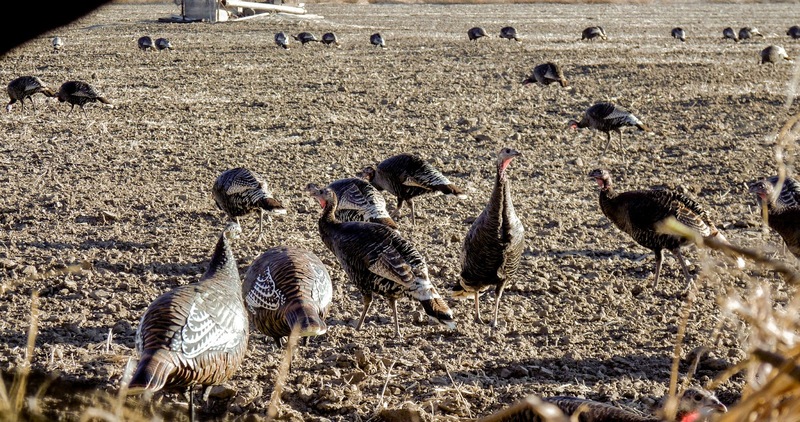 Nothing keeps turkeys away better than a dead bird laying in the field. About thirty minutes later a jake came in to check us out. I sent a Pearson Deadhead flying his direction. The jake didn't make it ten yards before dying in the field. Kelly and I let all the birds leave before getting out of the blind. By the time we got to the truck it was dark. We could hear plenty of toms gobbling from their roost, and we decided to leave our blind where it was for the following morning. The next morning was a turkey bonanza. There was a pile of birds to our east. Before the sun came up we heard one lone gobble to the west. I hoped that bird would walk towards all the commotion on the other side of us. There would be a great chance that he would swing by us on his way. Sure enough, that lone tom gave a thunderous gobble just a hundred yards away, but on the other side of the creek. I threw a couple of yelps his direction, hoping he'd come to us before going to join the real action. He did. I started to get my bow ready as he changed his course towards our set up. He must have started sprinting when I took my eyes off of him. Before I was fully ready I heard wings flapping across the creek. One second later he was puffed up against my jake decoy. I zipped another Pearson Deadhead his direction. The bird was all swelled up and spinning in circles when I was aiming. I did not wait to shoot. My arrow went exactly where I aimed, straight up the legs, and just below beard level. The tom made it back across the creek, but no further. My brother has spent many miles of walking to locate a few mountain birds in an area where they are quite sparse. 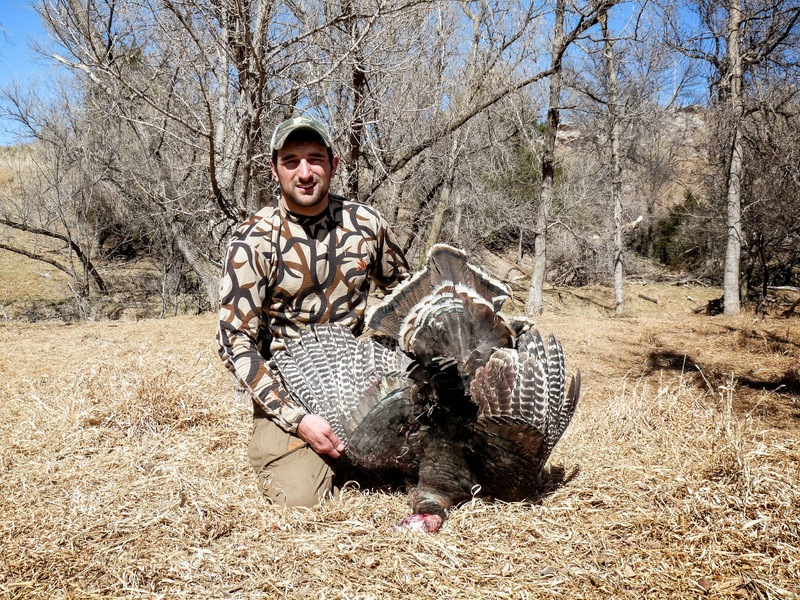 My biggest goal in turkey hunting is to get a mountain bird without a blind. After three years of scouting, and hundreds of miles of walking, there's a chance that Danny's hard work will finally pay off. Hunting those mountain birds is nothing like hunting the creek bottom toms in Nebraska. It is lots of walking, lots of days without a peep. When you finally find a tom he is as surprised to hear a hen yelp as we are to hear him gobble. So when we find one it will most likely happen pretty fast. I'll let you know how it goes!